Daily Mirror - Eight trains to operate this evening: Railway Dept. Eight trains to operate this evening: Railway Dept. 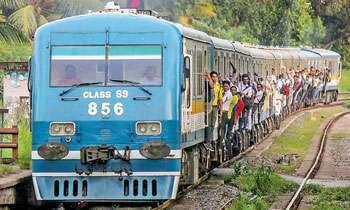 The Railway Department will operate eight trains by this evening despite the work stoppage by the railway trade unions, Railways Additional General WijayaSamarasinghe told Daily Mirror. He said trains would operate services on main lines -- Chilaw, Puttalam, Matara, Galle, Rambukkana, Kandy, Mahawa, and Avissawella. The SL Army should take over the railways. Time you packed your bags too.